With new roofing products coming to market, synthetic underlayment is becoming more popular. Builders love this product because it is durable, easy to work with and makes installation easier. Homeowners are asking for synthetic underlayment because it offers greater protection for the roof deck and because it lasts longer than felt underlayment. If you’re thinking about making the switch for your next roofing project, then here are the top reasons why contractors and homeowners alike are making the switch. Synthetic underlayment is stronger, with greater tear strength than felt underlayment. What this means for homeowners is that synthetics last longer. In damaging situations, such as windstorms, synthetic underlayment will hold up better than felt. Products like Epilay’s Protectite come with long-lived warranties. Homeowners will enjoy a 15-year limited warranty with Protectite Superior or up to a 40-year limited warranty with Protectite Platinum. Synthetics are better at repelling water than felt underlayment, which means that should the roof develop a leak over time, a synthetic underlayment will better protect the roof deck against moisture damage. Contractors turn to synthetic underlayment because not only do homeowners like it, but synthetic underlayment is easier to work with. Ease of installation means that contractors will spend less on labor and the job will be safer, too. 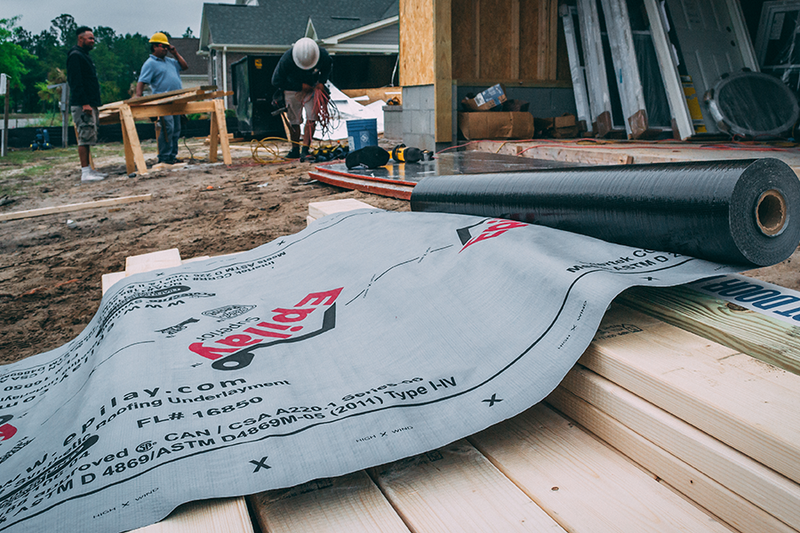 Epilay underlayment features GripWalk technology, which means that workers have a slip-resistant surface to work on. In addition, GripWalk surfaces are cooler, which is important when working on roofs in the hot summer sun. Because synthetic underlayment is less prone to tearing around fasteners, installation is easier and fewer pieces of underlayment will go to waste. Delays and labor shortages are a reality for many contractors, which means that sometimes, time elapses between stages of the roofing process. Synthetics are resistant to UV rays. Though UV resistance varies by product, most can be left exposed for a couple of months or more. Another advantage to synthetic materials is that they are lighter than felt underlayment. This means that workers will find rolls of synthetic underlayment easier to handle. Because rolls of synthetic underlayment offer more coverage than rolls of felt, fewer rolls are needed to complete the job. This works out to less trips carrying rolls of underlayment up and down the ladder, which saves time and minimizes risk to workers. For these reasons and more besides, many homeowners and contractors are turning to synthetic roof underlayment over felt roofing products. To learn more about the advantages of Epilay’s products, feel free to check out both the Protectite and the Plystik underlayment lines. Hi I would like to say as a contactor I have noticed roofs that never had ice damms with tarr paper then after new roof an the synthetic underlayment ice damms every where there is a lot of heat loss thru the new under layment not thru tarr paper ???? I would question how the underlayment you noticed this on was installed. We provide detailed installation instructions to avoid such issues.